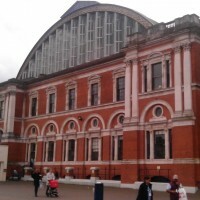 For the uninitiated, which included my good self until about a month ago, the Caffé Culture Show is an annual event for the café trade which was held in the soaring halls of the Kensington Olympia Exhibition Centre. It features suppliers to the café trade, from coffee machine manufacturers through bakers all the way to furniture suppliers. One of the most informative parts of my visit was when I went to a tasting at the Matthew Algie Stand. Here, Lee Hall, Coffee Sales Manager of Matthew Algie, was demonstrating that you didn’t need a fancy (and expensive) espresso machine to make good coffee, while also highlighting the impact of different brewing methods on a couple of different coffee beans. Lee had set up a small brew bar where he was making pour-over filter coffee using an Ethiopian Sidamo (light roast) and a Sumatran Gayo (dark roast). For comparison, he also put the same beans, with the same grind, through a Chemex filter. After taking his small audience through the usual steps (pre-rinsing the filter paper, ensuring the water is at the correct temperature, weighing the dose of ground coffee, pre-infusing the coffee, getting the pour right and, for the Chemex, weighing the water) he had us sample the finished coffee. This sort of comparison is quite uncommon, particularly if you were to do it by yourself, since you’d end up making and hence drinking rather a lot of coffee. I know a few roasters and/or coffee shops who offer cupping sessions, but it’s not something I’ve done and hence I was keen to see what the differences were. The first thing to say is that even though my palette is relatively unrefined, I could easily tell the difference between both the beans (which I’d expected) and the brewing methods (which I was wondering about). Overall, I definitely preferred the Sumatran over the Ethiopian and the pour-over filter over the Chemex, which confirms my pre-existing prejudices. To start with, I tend to prefer darker roasts and beans with more oomph over lighter roasts and more subtle coffees (the Ethiopian was definitely on the subtle-side). Add to that the Chemex tends to remove more of what I would call the coffee-ness of a coffee (perhaps “body” would be a less pejorative term!) with its thicker filter paper. This is great if you are looking to highlight the subtleties of a coffee, not so good if you want to keep all the bits I like. I should say in closing that the general opinion seems to be that the Chemex takes too much out of the Ethiopian, leaving a rather bland coffee behind, whereas it did quite well with the Sumatran. All-in-all it was a very worthwhile exercise and thanks to Lee and Matthew Algie for putting it on. Next stop was the Aeropress stand. I’ve had an Aeropress for about six months now and while I know some people swear by theirs, I’ve never really got the hang of mine. However, having watched a couple of baristas at work on the Aeropress, I was beginning to think I wasn’t doing it right. So, what better place to go for advice than TKC Sales, the UK Aeropress distributors? The first thing I learnt about the Aeropress is that you shouldn’t believe what it says on the sleeve. This was something that I’d worked out for myself a few minutes after reading it… While I’ve nothing against it as a method of preparing coffee, I find that some of the claims it makes are very hard to believe; for example, in my experience, the Aeropress makes nothing that comes close to a (good) espresso. In fact, I think the Aeropress is doing itself a disservice with this claim since its strengths lie elsewhere. As an example, I point to myself, since I’d been trying to use my Aeropress to make espresso-like drinks (flat whites, café au lait) with very limited success. Then I learnt the second rule of Aeropress club… Don’t believe anything in the instructions either. In fact, based on what I’ve learnt so far, the best advice I can give you is to throw the instructions away and start from scratch. Thanks to Sam and colleague from TKC Sales for the demonstration and all the useful info. As well as bringing lovely old espresso machines back to life (follow Dr Espresso on Facebook to see pictures of the restorations in progress), Dr Espresso also services and repairs more mundane commercial machines. And (drum roll please) Dr Espresso has recently opened his own coffee shop in Putney, called Doctor Espresso Caffetteria. Vanessa was all charm when trying to persuade me to visit (as if I needed any persuasion) while Russell had a more direct approach: “visit the coffee shop or I’ll find out where you live and pay you a visit on Christmas Day with a baseball bat!”. What I want to know is how he managed to find out I wanted a baseball bat for Christmas? Such a thoughtful man! My final discovery of the Caffé Culture Show is what I’m sure will turn out to be one of the most important breakthroughs of the 21st century. Being a trade show, there were lots of bakers and cake makers on hand, all of whom had lovely samples which they were only too happy to press upon you in the hope that you would stock them in your café. Partly out of fear for my waistline and partly out of a sense of guilt since I don’t have a café, I managed to resist until I came to the Sephra stand. Sephra distribute, amongst other things, chocolate fountains, hot chocolate machines, waffle makers (a complete waffle solution, in fact, including the waffle mixture). On offer was the latest breakthrough: the waffle on a stick! In case you hadn’t realised, I have this thing about waffles, but I’m the first to admit that they are messy things, often requiring two hands, cutlery and a bib. Enter the waffle on a stick, the first waffle that can be eaten single-handedly! I demonstrated this by eating a waffle, coated in chocolate from the chocolate fountain, while wearing my ivory waistcoat and successfully managing not to get chocolate on it (for the record I managed to get chocolate on my hands and the end of my nose, which I consider a major victory!). So, call Sephra and buy a waffle-making kit from them today and you’ll be my friend forever! Since I am just in the early phases of exploring how best to use my Aeropress (and I’m still not convinced it’s for me), I’m not really in a position to give anyone any advice, nor indeed to endorse any advice. All I will say is experiment, use a much bigger ratio of water to coffee and leave it to extract longer.